This practical training program prepares you for a polar ski expedition, in Antarctica, Greenland or Svalbard itself. It covers the basics of polar equipment, navigation, diet and daily schedules, as well as being a challenging expedition across the icescapes of Spitsbergen. Meet in Longyearbyen and check in to your hotel. Welcome dinner. Our Svalbard training program offers a broad introduction to polar expeditioning. We meet in Svalbard’s capital Longyearbyen, on the island of Spitsbergen (Norway) the night before our departure, however if you have time we suggest you arrive even earlier to allow time to discover the town and acclimatise to the conditions. Once we have completed our preparations including food and sled packing we ski out of town and into Adventdalen (Advent Valley) where we spend our first night. Flanked by mountains the valley is a beautiful introduction to the wonders of Svalbard. The following day we continue to Dronbreen (Dron Glacier) and climb to the pass that divides the large valleys of Adventdalen and Reindalen. We are in Nordenskiöld Land, named after thre Swedish polar explorer Otto Nordenskiöld. The view here is spectacular and you really get to appreciate the beauty of this region. We camp high to absorb the feel of this alpine region. Don't worry, the skiing is non-technical and we often ride our sleds like toboggans to reach lower ground. This area is closed to snowmobiles and is a real polar paradise where will will likely see no-one along the way. We may see birdlife or polar fox and are of course in the home of the polar bear, though they are less likely to make their way onto the mountain tops. However we prepare ourselves adequately with appropriate deterrents. Staying on the range, we ply our way through passes, around mountains and across glaciers staying a couple more nights up high before descending back down to Adventdalen and return to Longyearbyen. This trip is as much a mini expedition as it is a training trip. You will return home with a clear understanding of what it takes to put together and undertake a polar ski expedition. We wake at 6am to maximise our usable hours. First thing we do is light the stove to bring some warmth to the tent and begin heating water for breakfast and drinks. We also make sure that our thermoses are topped up with boiling water. A quick look outside reveals the perimeter wire connected to flares, our alert system for polar bears, and beyond a magnificent landscape of sharp snow-capped mountains, and the glacier upon which we are camped. By 8.30 we are ready to go with sleds packed, skis on and a sturdy climb into the mountains ahead of us. We travel in single file, the trail-breaker (usually the guide) doing most of the work, the team following in the tracks to conserve energy. And if you want to lead the group for a while we fully encourage it, in safe and uncomplicated terrain. In spring most of the glacier’s crevasses are filled in and pose no problem, but we always carry glacier travel equipment if the need arises to rope up. On skis we continue up the glacier, watching as peaks emerge into view, come alongside and recede onto the skyline. Soon we are at the top of the glacier and on snowfields that undulate into the horizon. 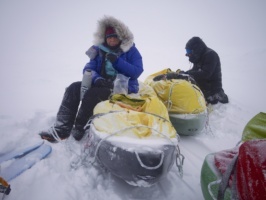 A quick break to drink from our thermoses and eat from our snack bags before we find our stride once again and lock into the polar plod, listening to the glide of our sleds, the swish of our skis and the rhythm of our hearts. Everything is in sync. Lunch is a scenic spot overlooking a frozen fiord. We sit on our sleds or foam seats, eating hot ramen noodles, cheese, salami and crackers and a collection of nuts, dried fruit and chocolate. We never go hungry. The afternoon brings some additional excitement as we reach a pass between the mountains after which we can straddle our sleds, skis on either side, and toboggan down a long slope. The ride is exhilarating as we glide down the incline, using the ski edges to steer and the rope traces thrown under the sled as a quick brake if needed. Down in a broad valley we pass fox tracks and see small herds of reindeer grazing on invisible grass. Polar bear sightings are rare but we are always prepared, armed with flare guns and firearms. It is not permitted to travel in these areas without them. The mountains lining the valley now obscure the sun and the temperature drops a few degrees as we march through the giant shadows. An hour later we ski into the fading light, our shadows long and golden across the valley floor. In the last light we set up our camp, securing the shelters to the ice and snow using tent stakes and ice screws, and shoveling snow onto the tent flaps to prevent any drift snow entering the tent layers. The guide rigs up the perimeter wire and we climb into our tents to light the life-giving stoves. Slowly the interior gains some order as mattresses, sleeping bags, kitchen and belongings find their place. Soon enough we are enjoying a hot soup followed by dinner and some saved chocolate. 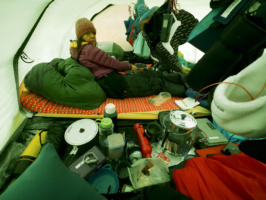 Something you will never be short of on an Icetrek polar expedition is sleep, we allocate a minimum of 8 hours every night so that you recover adequately for the day ahead. A weather forecast predicts light winds and blue sky, another perfect day in paradise. Sweet dreams! There are flights with SAS and Norwegian Air almost daily from Oslo, Norway to Longyearbyen. Flights are not included in the price. A visa is not required for Svalbard. When you arrive at Longyearbyen airport you can either take a taxi or the shuttle bus to your hotel, both accept credit cards. If you are staying at an AirBnB tell the driver the address or show him a map of the location and you will be dropped at the nearest hotel or convenient location. Once you have signed onto the trip you will receive a Svalbard Trip Information Booklet which has full details of how to plan for your trip. You will be informed where to meet based on your hotel and arrival time but most likely we will arrange to meet you in your hotel to complete a gear check in your room. What will be the temperature on arrival in Longyearbyen and during the trip? For the Svalbard Training program your sled will be 35 to 40 kg, 77 to 88 lb. Many of our Svalbard Training customers have never been on skis before. We will train you at a manageable pace while you are on the ice. Will there be any crevassing? Svalbard glaciers are crevassed though this time of year they are still mostly filled in with snow. However we always carry glacier travel equipment - ropes, harnesses, rescue gear - and use it when necessary. 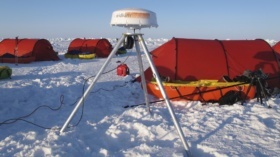 We use Icetrek Nilas and Polynya sleds made from slippery HDPE plastic. These are purpose designed and built by us to give optimal performance on ice and snow. We use Hilleberg Keron 4-person tents for two people and a Hilleberg Altai group tent. There is plenty of room to get comfortable but small enough to warm up quickly once the stove is operating. You are responsible for setting up, managing and taking down your tent. You do! This is a normal part of expedition life. We train you in how to use the stove. We carry an Iridium handheld phone and an Iridium modem, we can use both to call services in Longyearbyen and post daily updates and images to our Iceblog. We also carry a tracking beacon with emergency function and a Personal Locator Beacon which can be activated in an emergency. Signals from both are received by emergency services and relayed to Longyearbyen rescue services. We are also in mobile range for much of the trip. How long do we ski every day on the Svalbard Training trip? We start relatively gently, skiing for around four hours on the first day. We cover this by skiing one hour, then have a short stand-up break, then another hour with a sit down break. We do the same again and have lunch and then another 2 hourly sessions before camping. When everybody feels ready we extend to 7 and perhaps eight hours per day.